It’s been nice to visit my grandparents now that I’m back in Australia. I’ve probably spent more time with them in the past four months than I did in the past ten years! My most recent visit was for ANZAC Day. It was a really special weekend, so I’ve put together some stories for you. 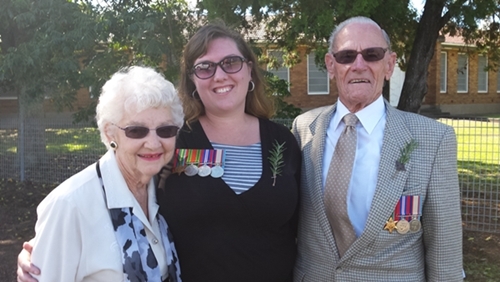 We went to the town’s ANZAC Day service together, all wearing rosemary for remembrance. My grandfather wore his WWII medals, and asked if I would like to wear my great-grandfather’s medals. I was honoured, and of course agreed to. My grandfather was so proud, and both of them took great pleasure in introducing me to every person they talked to (all weekend). It was the first ANZAC Day service I can remember attending in Australia. The community aspect of it was new to me. The town has had an army base for a long time and now also has a military training school. A large group of trainees led the parade, which also included veterans of both the army and the emergency services. The town band played, and schools and community groups marched as well. My grandfather only started attending the main service in the past few years. He has always attended the Dawn Service at the army base, but refused to attend the large service in town. He has never marched with other veterans. My grandmother talked about going without him for years, especially when their daughters were involved with the event. Pa once told me that he preferred observing ANZAC Day with a quiet remembrance of friends who died. He did not want to be held up as a hero, which is what marching felt like to him. It reminded me of something I liked about the dawn services in Beijing – there was a funereal feel, no sense of celebration. Back at home we watched dawn services telecast from Anzac Cove (Gallipoli) in Turkey and also from Villers-Bretonneux in France. This year marked 100 years since the original dawn landing at Gallipoli, so it was a bigger deal than normal. Pa also showed me his box of war-related bits and pieces. In addition to his medals, he had his epaulets, the colours from his commando group, and his commemorative medallion celebrating 60 years since the end of WWII. On Sunday I went to church with them – a church I have visited many times over three decades. It’s a lovely gothic style church building, opened in 1906. It has a pipe organ which was bought as a WWI memorial. It was installed in 1920 but probably dates to 1885 – and is still played every week. (There is more information about the organ, along with some lovely photos, on the Organ Historical Trust of Australia website.) The organ is only one of several memorials to fallen soldiers (particularly young men from the Singleton area) in the church. The local RSL had brought in poppies and Australian flags during the week to mark the memorials for ANZAC Day – including the plaques of veterans in the columbarium outside (where ashes are housed). After the service Pa led us outside to see my great-grandfather’s decorated plaque – where I discovered he was 96 when he died, not 94 as I’d always thought. 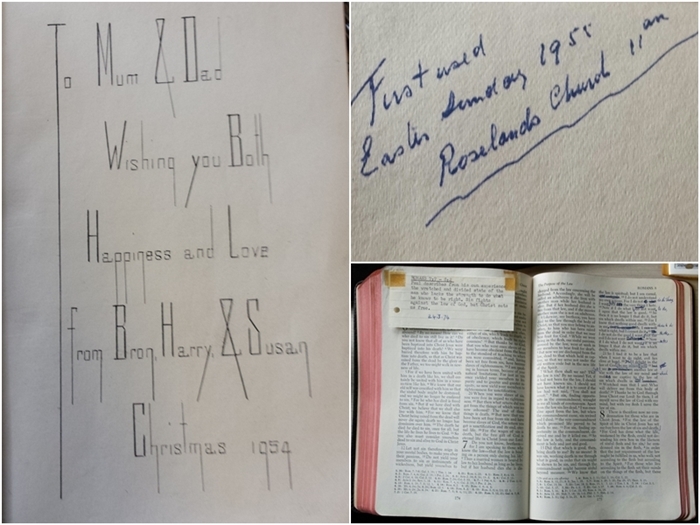 When we got home, my grandfather gave me a very special gift – my great-grandfather’s bible. My grandparents gave it to my great-grandparents as a Christmas present 60 years ago, and Pa showed me the inscription he has carefully written by hand back then. (My mum was a little miffed that she wasn’t included, given that she was born 5 days before Christmas that year!) Pa also showed me a note my great-grandfather made the following Easter, on its “first use” – which I assume means it was used in church to read or speak from. Pa also flipped through showing me notes my great-grandfather had made (and sermon notes he had taped in) through the text, and told me to feel free to write my own notes in there. It was also my grandparents’ anniversary – they have now been married 63 years. I made a trip for their 60th anniversary party three years ago, and gave them a cross-stitch I’d done as a present. It has pride of place in their foyer and anyone who comes in the front door hears how their granddaughter made it for them.